Jowar is one of the five top cereal crops in the world, along with wheat, oats, corn and barley. Jowar is an excellent gluten free whole grain and best for people who are glucose intolerant. Glucose intolerance is caused by the presence of protein called as gluten found in wheat and barley based foods which is absent in jowar. It is also rich in other nutrients. The glycemic index of jowar is 62 which falls under medium category. 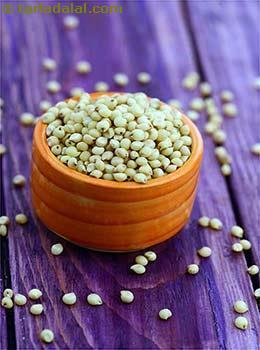 But the high fiber content in jowar compensates the overall effect. It is the healthiest choice to meet the daily carbohydrate intake. Is Jowar safe for Diabetics? 30 grams (approx. 1/4th cup) of jowar contains21.7 grams of carbohydrate which is complex. Complex carbohydrates require longer time to absorb in the digestive tract and release in the bloodstream. Also the high fiber content of jowar (3 grams in 1/4th cup) further contributes in slow absorption. Thus even though the glycemic index of jowar is medium as well as the glycemic load is 13.4, it is recommended to be included in your diet. Obviously moderation is the key so that your blood sugar levels won't fluctuate. It is important to control your portion size in every meal you have. Combine your jowar with lots of vegetables and make a khichdi out of it. The best way to use jowar is to use it in making chapatti/roti making it richer in nutrients. Jowar is an excellent source of magnesium which helps in improving insulin response. The high potassium and low sodium levels manage your blood pressure. Is Jowar suitable for Weight Loss? Fiber is the most important nutrient because it adds bulks to our food. It allows the food to stay in the blood stream for a longer period of time which leads to slow absorption of the nutrients. Thus whenever you have a meal; rich in fiber like jowar combined with other vegetables, jowar bhakri or jowar bajra roti, you will feel full for a longer period of time without remaining hungry. Gradually your calorie intake will reduce, taking you closer to weight loss. However, nothing better than incorporating regular physical activity to your weight loss goals. Moreover healthy lifestyle leads to much easier weight loss.